Denmark’s Energy Flows for the year 2016 were published by Danish Energy Agency (‘Energistyrelsen’). For detail, I recommend to study the high-quality image of the Sankey diagam in this PDF. Flows are in petajoule (PJ). Smaller flows are shown with a minimum width, so they are not to scale with the others, but remain visible. Even zero flows are shown, either because there is actually a quantity (less than 1 PJ) that is just rounded, or, because in other years there might be a flow quantity available for them. Arrows arrive at the nodes separately, their flow labels shown inside the node. This feature enhances legibility quite a bit. 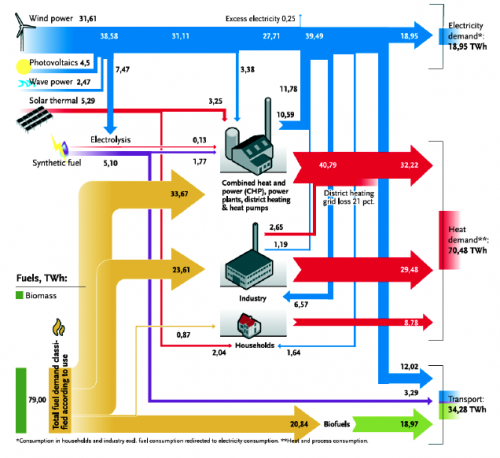 Also see this 2012 post on a Denmark 2050 Nuclear Free Energy Scenario. Found the below Sankey diagram in an article titled ‘La politique énergétique du Danemark. Vers un scénario 100% renouvelable en 2050’ by Thierry de Larochelambert of Institut FEMTO-ST via sortirdunucleaire.org. The 2050 scenario by IDA foresees a nuclear free, 100% renewable energy production with biomass and wind power being the main energy souces. As the article explains, the transition from 50% to 100% independence between 2030 and 2050 is an extraordinary technical, scientific and economic challenge (“un défi technique, scientifique et économique extraordinaire”, p. 6) that will require some measures to be implemented, such as a 10% drop in electric energy demand, and a shiftover of 50% of Danish freight transports being moved to rail. Exciting article. For those of you who read French: here it is. The original ‘IDA Climate Plan 2050 by the Danish Society of Engineers (IDA) where this Sankey diagram was first published is here (in English).